Discussion went global this week as researchers converged from Gyeongsang National University in South Korea, MU and Washington University at Bond Life Sciences Center for the sixth MU-GNU International Joint Symposium in Plant Biotechnology. Plant biologists from each university shared their research, ranging from molecular biology and signaling to breeding soybeans for improved yields. The symposium is held every two years, alternating locations between the U.S. and South Korea. This conference marks the eleventh year of collaboration between GNU and MU. As those involved share new research and ideas, these collaborations create opportunities. A former student in Stacey’s lab recently received a doctoral degree from both universities as part of a joint-doctoral degree program. Undergraduate Korean students can also complete a “2+2” degree, where students can begin their studies with two years at GNU and finish with two years at MU. The schools also exchange faculty members. 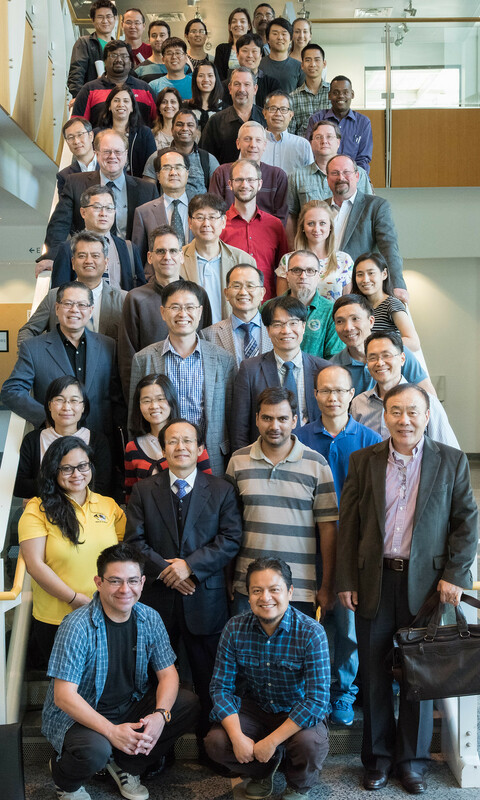 GNU researchers Jong Chan Hong and Woo Sik Chung completed sabbaticals at MU. Stacey has spent time in Korea, and his lab receives funding from Korean grants. “Getting our students to interact with Korean students and Korean faculty expands their horizons, gets them in contact with other cultures and is really part of creating an intellectual environment where students can grow,” Stacey said. For more information about the science exchanged, visit http://staceylab.missouri.edu/symposium.